Gary Clinton is as enthusiastic a guitar player as you’ll meet. Even we were surprised, however, when he was demonstrating and playing with the Pro Co Turbo Rat. When he starts opening up this little beauty of a stomp box, the smile is all over his face. If you’ve never heard of the Turbo Rat before then you are in for a treat. This small effects pedal really does pack a powerful punch in the field of sonic smashups. Is The Pedal Hard To Use? The simple and straightforward answer to that question is a definite no. As you can see on the initial thumbnail of the video it’s more or less idiot proof. Many guitarist just like to turn it up and let it melt the faces of the audience. Despite this temptation, Gary does take time to show you some subtle uses of the controls and what they can achieve. 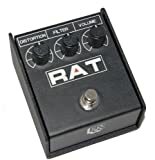 The Turbo Rat may not be the most well known effects pedal in the world, but it surely has to be one of the loudest! If you have found your way to this lesson from a Google search or from a web 2.0 site, we’d like to let you know about our other lessons in this course. We have a large range of lessons which exclusively deal with guitar effects pedals detailed in our Pedal Power guitar course. This lesson is just one of many within the course. Click on the link just past or access all our free content from the menu titled underneath Free Guitar Lessons. We’d love you to be part of GMI. There are two ways of doing this. If you join our mailing list by filling in the details below, you’ll be notified by email about all our latest lessons. If you would like to be part of GMI then hit the JOIN UP button on the menu at the top of the page. You’ll be able to access material that is held within our free section.